A proposed artificial island to be constructed atop the Misteriosa Bank, an undersea mountain range/landmass some 12 feet underwater, situated approximately 115 miles west of Grand Cayman. The basal area, which is comprised of three submerged islands, has also been referred to as the Rosario Reefs. This swath of the Caribbean is purportedly located in international waters. This enchanting “oasis in the middle of the ocean” will be built on giant concrete pilings/platforms, and will include apartments, condos, retail establishments, shopping malls, hotels, banks, docks, warehouses, a casino, a convention center, a university, a stock market, and a medical center. They will also have their own airport and airline. New Utopia, which hopes to evolve as the newest, most beautiful and “most perfect city/state ever conceived,” (and to attain the highest standard of living in the world) is a constitutional monarchy/sovereignty that was concocted in September of 1996. This “refreshing haven from runaway bureaucracy” and over-regulation is the vision of a long-time businessman/entrepreneur named Lazarus R. Long. Originally, his name was Howard Turney, which lacked even the tiniest hint of superhuman connotations. So he legally changed it in 1995, inspired by Robert Heinlein's immortally heroic character (and alluding to a deep-seated preoccupation with long-livedness, about which we will later learn more). He was also a fan of Ayn Rand, and was heavily influenced by her work. 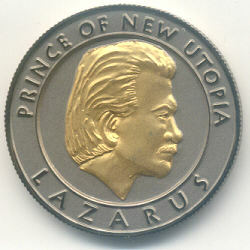 According to Susan Wright, of New Utopia's Information Office, “Prince Lazarus and the Board of Governors established a quota of 4,000 for Charter Citizens who will always be remembered as the founding citizens. Each one will have his/her name engraved on a marble wall on the grounds of Government House as the first citizens of the Principality of New Utopia and honored by all subsequent generations of New Utopians. When the quota of 4,000 is filled there will be no other applications accepted for a period of 2 years, at that time all applicants will have to file with the immigration department like they do in any other country. The criteria for becoming a citizen will never be so easy or unrestricted again.” Also, “we will immediately file for ‘Observer Status’ with the UN. By their charter they can not refuse us. It states; ‘all must be accepted regardless of size of territory or number of citizens’. This will assure that all member nations will recognize our passports”. Lazarus has already written a letter to Secretary General Kofi Annan, in which he stated “we beg the United Nations for their support and protection”. Jorge Fernández Vidal, who by now had entered into the business of facilitating the production of coins on behalf of numerous “unrecognized states” that lacked the necessary levels of numismatic knowledge. 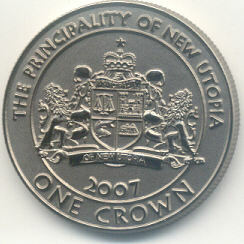 During January 2007 after much-anticipated coin, One Crown dated 2007 was finally a reality. A 6-piece set consisting of nickel+Nordic gold, Nordic gold+nickel, nickel+copper, copper, Nordic gold, and silver. The first 3 are actually bi-metallic, insofar as the sculpted bust of Prince Lazarus is coated with a thin layer of the second metal. At present exchange rate of 1.25 United States Dollars (USD) is to 1 New Utopian Crown (UTC). In the end I would thank Eric Victor McCrea for his above information on Principality of New Utopia.